Paris: Le Fuel, [ca. 1813]. Oblong 32mo (10.6 cm, 4.125"). Col. frontis., engr. t.-p., 258 pp. ; 12 col. plts. Scarce collection of Perrault's classic fairy tales: "Le Petit chaperon rouge," "Les fées," "La Barbe bleue," "La Belle au bois dormant," "Le Maître chat ou le Chat botté," "Cendrillon," "Riquet à la houpe," "Le petit Poucet," "L'Adroite princesse, ou Les aventures de Finette," "Peau d'âne," and "Les souhaits ridicules," with => a preliminary "Avis sur les ouvrages de Charles Perrault." The stories are given here in a mix of prose and verse, closing with poetic morals printed in a striking French script font. This dainty presentation is illustrated with a total of => 14 color-printed plates, including the engraved frontispiece and engraved title-page, stipple-engraved by Noël J[eun]e after designs by Sébastien Leroy. The publication date is suggested by Gumuchian 9s ca. 1825, who notes that the illustrations in this "charmante édition" are "joliment coloriés." Princeton gives the publication date as . This attractive, early 19th–century Parisian printing is now scarce: a search of WorldCat finds => only one U.S. institution reporting ownership of a physical copy (Princeton). 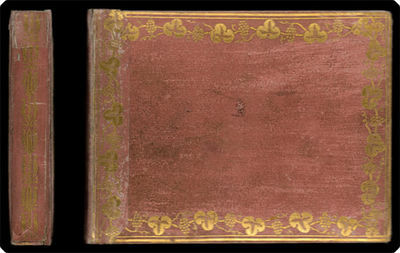 Binding: Contemporary mauve calendered paper–covered sides, covers framed in wide gilt grapevine roll, spine with complementary gilt foliate roll. All edges gilt. Provenance: From the children's book collection of Albert A. Howard, small booklabel ("AHA") at rear.